This article gives information about the relative size of denominations, based mainly on claims by the churches themselves. Figures below are in accordance with Church’s Book of Statistics, at the end of 2014. 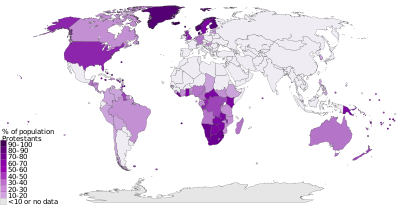 A map of Protestantism (including Anglicanism) by population percentage. Protestantism is the second largest major group of Christians after the Catholic Church by number of followers. Estimates vary considerably, from 400 million up to more than a billion. One of the reasons is the lack of a common agreement among scholars about which denominations constitute Protestantism. For instance, most sources but not all include Anglicanism as part of Protestantism (see below). Moreover, Protestant denominations do not form a single communion comparable to those of the Catholic Church and Eastern Orthodoxy. Nevertheless, 900 million is the most accepted figure among various authors and scholars, and thus is used in this article. Note that 900 million figure also includes Anglicanism, as well as Anabaptists, Baptists and multiple other groups which have in their scope some denominations that might disavow a common "Protestant" designation, and would rather prefer to be called, simply, "Christian". Groups listed have origins in the Lord's Recovery movement associated with Watchman Nee and Witness Lee. The Shouters are an offshoot of the Local churches, considered a dangerous sect by the Chinese government; due to the extremely decentralized nature of both groups, there is controversy over which house churches should be actually considered part of each. Eastern Lightning, which is in turn an offshoot of The Shouters, is very hierarchical (in contrast to its predecessors) and teaches that Christ has already returned as a woman named Lightning Deng. A map of the Anglican Communion (blue), the Porvoo Communion (green), comprising European Anglican and Lutheran churches, and the Union of Utrecht (Old Catholic) (red), a federation of Old Catholic Churches. A map of Eastern Orthodoxy by population percentage. The most common estimate of the number of Eastern Orthodox Christians worldwide is 225–300 million, forming a single communion, making it the second largest, single Christian denomination behind the Catholic Church. These are the adherents of the recognized Orthodox jurisdictions (autocephalous and autonomous churches) that are in full communion with each other. In addition, there are some Orthodox splinter groups and non-universally recognized churches. A map of Oriental Orthodoxy by population percentage. Oriental Orthodox churches are the churches descended from those that rejected the Council of Chalcedon in 451. Despite the similar name, they are therefore a different branch of Christianity from the Eastern Orthodox (see above). Note that this is quite distinct from the orthodox Trinitarian restorationism of groups such as the Disciples of Christ, despite some shared history. Various denominations self-identifying as Catholic, despite not being affiliated with the Catholic Church. ↑ "Catholic Church Statistics 2016 – ZENIT – English". ↑ "Why So Many Rites in the Church – ZENIT – English". ↑ 3.00 3.01 3.02 3.03 3.04 3.05 3.06 3.07 3.08 3.09 3.10 3.11 3.12 3.13 3.14 3.15 3.16 3.17 3.18 3.19 3.20 "The Other Catholics: A Short Guide to the Eastern Catholic Churches". Catholiceducation.org. Retrieved 2011-08-13. ↑ "CCEO: text – IntraText CT". Intratext.com. 2007-05-04. Retrieved 2011-08-13. ↑ "Society Of St. Pius X (SSPX) Criticizes Pope Francis". The Huffington Post. 18 April 2013. Retrieved 26 October 2014. ↑ Jay Diamond, Larry. Plattner, Marc F. and Costopoulos, Philip J. World Religions and Democracy. 2005, page 119. ( also in PDF file (archived from the original on 2008-04-13), p49), saying "Not only do Protestants presently constitute 13 percent of the world's population—about 800 million people—but since 1900 Protestantism has spread rapidly in Africa, Asia, and Latin America." ↑ Hillerbrand, Hans J. (2 August 2004). "Encyclopedia of Protestantism: 4-volume Set". Routledge – via Google Books. ↑ Clarke, Peter B.; Beyer, Peter (7 May 2009). "The World's Religions: Continuities and Transformations". Taylor & Francis – via Google Books. ↑ Brown, Stephen F. (5 September 2017). "Protestantism". Infobase Publishing – via Google Books. ↑ Noll, Mark A. (25 August 2011). "Protestantism: A Very Short Introduction". OUP Oxford – via Google Books. ↑ "Baptist World Alliance". community.christianemergencynetwork.org. 2014-08-14. ↑ "ACP: Worship attendance rises, baptisms decline". Baptist Press. Retrieved 26 June 2018. ↑ About Us The National Baptist Convention, USA, Inc.
↑ 18.00 18.01 18.02 18.03 18.04 18.05 18.06 18.07 18.08 18.09 18.10 18.11 18.12 18.13 18.14 18.15 18.16 18.17 18.18 18.19 18.20 18.21 18.22 18.23 18.24 18.25 18.26 18.27 18.28 18.29 "Baptist World Alliance – Statistics". ↑ "Church of Christ in Congo – Baptist Community of Congo". Oikoumene.org. Retrieved 2011-08-13. ↑ "Conservative Baptist Association of America (CBAmerica)| American Denominations | The Association of Religion Data Archives". Thearda.com. Retrieved 2011-08-13. ↑ "National Association of Free Will Baptists| American Denominations | The Association of Religion Data Archives". Thearda.com. Retrieved 2011-08-13. ↑ Religions of the World: A Comprehensive Encyclopedia of Beliefs and . Books.google.it. 2010-09-21. ISBN 9781598842043. Retrieved 26 October 2014. ↑ "Zahlen und Fakten zum kirchlichen Leben – 2018" (PDF). ekd.de. Retrieved 31 July 2018. ↑ ""Ethiopian Evangelical Church Mekane Yesus"". News and Events. EECMY. Retrieved 10 February 2017. ↑ "Tanzania – The Lutheran World Federation". ↑ "Sweden – The Lutheran World Federation". ↑ "Member Churches (All) – ::: Welcome to UNITED EVANGELICAL LUTHERAN CHURCHES IN INDIA :::". Uelci.org. Retrieved 2011-08-13. ↑ "Denmark – The Lutheran World Federation". ↑ 32.0 32.1 32.2 32.3 32.4 "Indonesia – The Lutheran World Federation". ↑ "Finland – The Lutheran World Federation". ↑ "Norway – The Lutheran World Federation". ↑ "Summary of Congregational Statistics as of 12/31/2017" (PDF). elca.org. Evangelical Lutheran Church in America. September 11, 2018. Retrieved February 4, 2019. ↑ "United States – The Lutheran World Federation". ↑ "Madagascar – The Lutheran World Federation". ↑ "Nigeria – The Lutheran World Federation". ↑ "LCMS statistics for 2016: membership down, contributions up". Lcms.org. Retrieved 8 March 2018. ↑ "Papua New Guinea – The Lutheran World Federation". ↑ 43.0 43.1 "Namibia – The Lutheran World Federation". ↑ "Brazil – The Lutheran World Federation". ↑ "South Africa – The Lutheran World Federation". ↑ "Welcome to the CELC Website!". Celc.info. 2008-10-09. Retrieved 2011-08-13. ↑ "Statistics". EFCA. Archived from the original on 22 July 2011. Retrieved 13 August 2011. ↑ "Lutheran CORE Update". spiritofaliberal.com. Spirit of a Liberal. Retrieved March 7, 2018. ↑ "Cameroon – The Lutheran World Federation". ↑ "Austria – The Lutheran World Federation". ↑ "Zimbabwe – The Lutheran World Federation". ↑ "Latvia – The Lutheran World Federation". ↑ "Iceland – The Lutheran World Federation". ↑ "Brazil – International Lutheran Council". ↑ "France – The Lutheran World Federation". ↑ "Slovakia – The Lutheran World Federation". ↑ "Hungary – The Lutheran World Federation". ↑ "Estonia – The Lutheran World Federation". ↑ "Member Churches". Worldmethodistcouncil.org. Retrieved 26 October 2014. ↑ Tooley, Mark. "The American Spectator : Thriving Christianity". Spectator.org. Retrieved 2011-08-13. ↑ "African Methodist Episcopal Church". Oikoumene.org. Retrieved 2011-08-13. ↑ "'Our Mission Connexion' – Nazarene Communications Network". Ncnnews.com. Retrieved 2011-08-13. ↑ "Methodist Church Nigeria". Oikoumene.org. Retrieved 2011-08-13. ↑ "Salvation Army International, statistics page". Retrieved 27 March 2018. ↑ "Methodist Church of Southern Africa". Oikoumene.org. Retrieved 2011-08-13. ↑ "Korean Methodist Church". 1 January 2006. Archived from the original on 28 September 2012. ↑ "African Methodist Episcopal Zion Church". Oikoumene.org. Retrieved 2018-03-13. ↑ "United Methodist Church of Ivory Coast". Oikoumene.org. Retrieved 2011-08-13. ↑ "Fast Facts". Fmwm.org. Archived from the original on 26 July 2011. Retrieved 13 August 2011. ↑ "Christian Methodist Episcopal Church". Oikoumene.org. Retrieved 2011-08-13. ↑ "Methodist Church Ghana". Oikoumene.org. Archived from the original on 21 May 2011. Retrieved 13 August 2011. ↑ "Methodist Church in India". Oikoumene.org. Retrieved 2011-08-13. ↑ "Methodist Church in Kenya". Oikoumene.org. Retrieved 2011-08-13. ↑ "Wesleyan Church| American Denominations | The Association of Religion Data Archives". Thearda.com. Retrieved 2011-08-13. ↑ "Methodism in Numbers – Statistics at a Glance" (PDF). methodist.org.uk. The Methodist Conference. July 2018. Retrieved 2 October 2018. ↑ "Methodist Church in Brazil". Oikoumene.org. Retrieved 2011-08-13. ↑ "About The World Communion of Reformed Churches (WCRC)". World Communion of Reformed Churches (WCRC). Archived from the original on 27 October 2014. Retrieved 26 October 2014. ↑ "Old First Reformed Church in Park Slope : : The Reformed Church". Oldfirstbrooklyn.org. Retrieved 26 October 2014. ↑ "Presbyterian Church of East Africa". Oikoumene.org. Retrieved 2011-08-13. ↑ "Presbyterian Church of Nigeria". Oikoumene.org. Retrieved 26 October 2014. ↑ "Presbyterian Church of Africa". Oikoumene.org. Archived from the original on 4 September 2011. Retrieved 2011-08-13. ↑ "Presbyterian Church of Korea". Oikoumene.org. Retrieved 26 October 2014. ↑ "Church of Christ in Congo – Presbyterian Community of Congo". Oikoumene.org. Archived from the original on 6 September 2011. Retrieved 2011-08-13. ↑ "Presbyterian Church of Cameroon". Oikoumene.org. Retrieved 2011-08-13. ↑ "The Presbyterian Church of India" (PDF). Unitingworld.org.au. Retrieved 26 October 2014. ↑ Patrick Johnstone and Jason Mandryk, Operation World: 21st Century Edition (Paternoster, 2001), p. 419. ↑ "Estatísticas 2011 : Dados ESTIMADOS" (PDF). Executivaipb.com.br. Retrieved 26 October 2014. ↑ "Presbyterian Church in Cameroon". Oikoumene.org. Retrieved 2011-08-13. ↑ "Address data base of Reformed churches and institutions". Reformiert-online.net. Retrieved 26 October 2014. ↑ "Presbyterian Church of Ghana". Oikoumene.org. Retrieved 2011-08-13. ↑ "United Church of Christ in the Philippines". Oikoumene.org. Retrieved 2011-08-13. ↑ "Uniting Presbyterian Church in Southern Africa". Oikoumene.org. Retrieved 2011-08-13. ↑ "United Church Statistics" (PDF). The United Church of Canada. 21 February 2018. ↑ "PCA Statistics Five Year Summary". Pcaac.org. Retrieved 26 October 2014. ↑ "Presbyterian Church of Pakistan". Oikoumene.org. Retrieved 2011-08-13. ↑ "About The Church of Scotland". The Church of Scotland. Retrieved 2018-08-21. ↑ "Presbyterian Church in Rwanda". Oikoumene.org. Retrieved 2011-08-13. ↑ "PCT Administration – Structure and Statistics". pct.org.tw. Retrieved 2018-02-22. ↑ "Church of Jesus Christ in Madagascar (FJKM)". Oikoumene.org. Retrieved 2011-08-13. ↑ "United Church of Zambia". Oikoumene.org. Retrieved 2011-08-13. ↑ Administrator. "Qui sommes-nous?". Eeccameroun.org. Retrieved 26 October 2014. ↑ "Federation of Swiss Protestant Churches". Oikoumene.org. Retrieved 2011-08-13. ↑ "Protestant Evangelical Church in Timor". Oikoumene.org. Archived from the original on 5 September 2011. Retrieved 2011-08-13. ↑ "Statistische Jaarbrief 2017". Protestantse Kerk in Nederland. Retrieved 2018-10-02. ↑ "Christian Evangelical Church in Minahasa". Oikoumene.org. Retrieved 2011-08-13. ↑ "United Church in Papua New Guinea". Oikoumene.org. Retrieved 2011-08-13. ↑ "Protestant Church in Western Indonesia". Oikoumene.org. Archived from the original on 8 February 2013. Retrieved 2011-08-13. ↑ "Evangelical Christian Church in Tanah Papua". Oikoumene.org. Archived from the original on 13 February 2008. Retrieved 13 August 2011. ↑ "Protestant Church in the Moluccas". Oikoumene.org. Retrieved 2011-08-13. ↑ "Reformed Church in Hungary". Oikoumene.org. Archived from the original on 21 May 2011. Retrieved 2011-08-13. ↑ "Reformed Church in Romania". Oikoumene.org. Retrieved 2011-08-13. ↑ "Uniting Reformed Church in Southern Africa". Oikoumene.org. Retrieved 2011-08-13. ↑ "Toraja Church". Oikoumene.org. Retrieved 2011-08-13. ↑ "Reformed Church of France". Oikoumene.org. Retrieved 2011-08-13. ↑ "Lesotho Evangelical Church". Oikoumene.org. Retrieved 2011-08-13. ↑ "Evangelical Christian Church in Halmahera". Oikoumene.org. Retrieved 2011-08-13. ↑ "Christian Church of Sumba". Oikoumene.org. Retrieved 2011-08-13. ↑ "Karo Batak Protestant Church". Oikoumene.org. Retrieved 2011-08-13. ↑ "Reformed Church of Christ in Nigeria". Oikoumene.org. Archived from the original on 21 September 2012. Retrieved 13 August 2011. ↑ "Reformed Church in Zambia". Oikoumene.org. Retrieved 2011-08-13. ↑ "Evangelical Reformed Church of Angola". Oikoumene.org. Retrieved 14 March 2018. ↑ "Reformed Church in America| American Denominations | The Association of Religion Data Archives". Thearda.com. Retrieved 2018-03-09. ↑ "Yearbook 2016" (PDF). crcna.org. Christian Reformed Church in North America. Retrieved February 27, 2018. ↑ "Kalimantan Evangelical Church". Oikoumene.org. Retrieved 2011-08-13. ↑ "Javanese Christian Churches". Oikoumene.org. Retrieved 2011-08-13. ↑ "Indonesian Christian Church (GKI)". Oikoumene.org. Retrieved 2011-08-13. ↑ "The Church of Christ in the Sudan among the Tiv (NKST)". Recweb.org. Retrieved 2011-08-13. ↑ "EKD – Church of Lippe". Oikoumene.org. Retrieved 2011-08-13. ↑ "Evangelical Church of Congo". Oikoumene.org. Retrieved 2011-08-13. ↑ "Christian Evangelical Church of Sangihe Talaud". Oikoumene.org. Retrieved 2011-08-13. ↑ "Christian Church of Central Sulawesi". Oikoumene.org. Retrieved 2011-08-13. ↑ "EKD – Evangelical Reformed Church in Bavaria and North-Western Germany". Oikoumene.org. Retrieved 2011-08-13. ↑ "Evangelical Congregational Church in Angola". Oikoumene.org. Retrieved 2011-08-13. ↑ "United Congregational Church of Southern Africa". Oikoumene.org. Retrieved 2011-08-13. ↑ "mwc-cmm.org". mwc-cmm.org. Retrieved 2016-09-05. ↑ "Adherents.com". Adherents.com. Retrieved 2011-08-13. ↑ "STATISTICS OF THE ASSEMBLIES OF GOD" (PDF). Assemblies of God, USA. 2012-08-02. ↑ Association of Christian Churches. Dr. James B. Gould. Washington, DC, USA. 2006. ↑ God Is Back: How the Global Revival of Faith Is Changing the World. Books.google.com. 2009-04-02. ISBN 9781101032411. Retrieved 15 March 2018. ↑ "Holy Convocation | COGIC FACT SHEET". Cogic.net. 1968-04-03. Retrieved 2011-08-13. ↑ "Born Again Movement". Adherents.com. Retrieved Dec 10, 2014. ↑ "Our World". Cmalliance.org. Retrieved 2011-08-13. ↑ Gordon Melton. "African Initiated Churches". Academic Dictionaries and Encyclopedias. Retrieved 26 October 2014. ↑ "Redemption Camp – Armin Rosen". ↑ "Church of the Lord (Aladura) Worldwide". Oikoumene.org. Retrieved 2011-08-13. ↑ "Council of African Instituted Churches". Oikoumene.org. Retrieved 2011-08-13. ↑ "Church of Christ Light of the Holy Spirit". Oikoumene.org. Retrieved 2011-08-13. ↑ "African Church of the Holy Spirit". Oikoumene.org. Retrieved 2011-08-13. ↑ "African Israel Nineveh Church". Oikoumene.org. Retrieved 2011-08-13. ↑ "Adventist Review Online – Propelled by TMI, Adventist Church Tops 20 Million Members". www.adventistreview.org. ↑ "New Apostolic Church International". Nak.org. Retrieved 26 October 2014. ↑ "Church of Christ in Congo – Community of Disciples of Christ in Congo". World Council of Churches. 2006. Retrieved 2014-09-01. ↑ "The Anglican Communion Official Website – Provincial Directory". Anglicancommunion.org. Retrieved 2011-08-13. ↑ "Church of England". Oikoumene.org. Retrieved 2018-12-24. ↑ "Church of Nigeria:". Anglican-nig.org. 2007-04-18. Archived from the original on 27 September 2007. Retrieved 2011-08-13. ↑ "Church of Uganda". Oikoumene.org. Retrieved 2011-08-13. ↑ "Anglican Church of Kenya". Oikoumene.org. Retrieved 2011-08-13. ↑ "CSI Christ Church – Location Map". Csimichigan.org. Retrieved 26 October 2014. ↑ "Number of Australian Anglicans falls by 580,000 in five years: Census 2016". tma.melbourneanglican.org.au. 28 June 2017. Retrieved 13 February 2018. ↑ "Anglican Church of Southern Africa". Oikoumene.org. Retrieved 2011-08-13. ↑ "Anglican Church of Tanzania". Oikoumene.org. Retrieved 2011-08-13. ↑ "Table of Statistics of the Episcopal Church" (PDF). episcopalchurch.org. Retrieved 2018-10-17. ↑ "2011 National Household Survey – Religion". Statistics Canada, 2.statcan.ca. Retrieved 2018-12-24. ↑ "Church of North India". Oikoumene.org. Archived from the original on 20 May 2011. Retrieved 13 August 2011. ↑ "Province of the Episcopal Church in Rwanda". Oikoumene.org. Retrieved 2011-08-13. ↑ "Church of the Province of Central Africa". Oikoumene.org. Retrieved 2011-08-13. ↑ "Anglican Church of Burundi". Oikoumene.org. Retrieved 2011-08-13. ↑ "Church in the Province of the West Indies". Oikoumene.org. Retrieved 2011-08-13. ↑ "Anglican Church in Aotearoa, New Zealand and Aotearoa". Anglican Church in Aotearoa, New Zealand and Aotearoa. Anglican Church in Aotearoa, New Zealand and Aotearoa. Retrieved 21 September 2015. ↑ "Church of the Province of the Indian Ocean". Oikoumene.org. Retrieved 2011-08-13. ↑ "Church of Christ in Congo – Anglican Community of Congo". Oikoumene.org. 2003-12-20. Retrieved 2011-08-13. ↑ "Church of Pakistan". Oikoumene.org. Retrieved 2011-08-13. ↑ "Church of Ireland". Oikoumene.org. Archived from the original on 5 September 2011. Retrieved 13 August 2011. ↑ "Church of the Province of West Africa". Oikoumene.org. Retrieved 2011-08-13. ↑ "Church of Melanesia". Oikoumene.org. Archived from the original on 21 May 2011. Retrieved 2011-08-13. ↑ "Episcopal Church in the Philippines". Oikoumene.org. Retrieved 2018-04-02. ↑ "Traditional Anglican bloc eyeing union with Rome is far-flung group". Reuters. Retrieved 26 October 2014. ↑ "South African Christian". Sachristian.co.za. Retrieved 26 October 2014. ↑ Mary Fairchild. "Orthodox Affiliation". About. Retrieved 26 October 2014. ↑ Johnston & Sampson 1995, p. 330. ↑ "Church of Greece". oikoumene.org. World Council of Churches. Retrieved October 14, 2017. ↑ "Патріярхат / Архів / Церкви України: тенденції розвитку:". Patriyarkhat.org.ua. 2003-11-21. Retrieved 2011-08-13. ↑ "Ethiopia: Orthodox Head Urges Churches to Work for Better World". Retrieved 2006-09-13. ↑ "Catholicos of All Armenians". armenianchurch.org. Mother See of Holy Etchmiadzin. ↑ "CNEWA - The Syrian Orthodox Church". www.cnewa.org. http://www.cnewa.org/default.aspx?ID=8&pagetypeID=9&sitecode=HQ&pageno=3. ↑ "Syrian Orthodox Patriarchate of Antioch and All the East — World Council of Churches" (in en). www.oikoumene.org. https://www.oikoumene.org/en/member-churches/syrian-orthodox-patriarchate-of-antioch-and-all-the-east. ↑ Fahlbusch, Erwin; Lochman, Jan Milic; Mbiti, John S.; Vischer, Lukas; Bromiley, Geoffrey William (2003). The Encyclopedia Of Christianity (Encyclopedia of Christianity) Volume 5. Wm. B. Eerdmans Publishing Company. p. 285. ISBN 0-8028-2417-X. ↑ "LDS Statistics and Church Facts". Lds.org. Retrieved 2018-05-17. ↑ Communication Services of Community of Christ, Independence Mo. "Community of Christ General Denominational Information". Cofchrist.org. Archived from the original on 25 July 2011. Retrieved 2011-08-13. ↑ "About Jehovah's Witnesses". JW.org. 2017. Retrieved 2018-03-28. ↑ "MAP: Iglesia ni Cristo in the Philippines". ↑ Skinner, Donald E. "membership growth in uua slows down". uuworld.org. Retrieved 2011-08-13. ↑ Christian, a born again. "Major World Christian Denominations, Rank, Size, Members, Adherents, Number Born Again; # in Christ's Congregation - Belief Bits.com". ↑ "Philippine Independent Church". Oikoumene.org. Retrieved 2011-08-13. ↑ (GMT+8) (2010-12-28). "Chinese Newspaper Attacks Pope's Christmas Criticism｜Culture｜News｜WantChinaTimes.com". Wantchinatimes.com. Retrieved 2011-08-13. ↑ "Beliefs". Catholicshaveachoice.com. Retrieved 2011-08-13. ↑ Lundberg, Magnus (2015). "Modern alternative popes" (PDF). uu.diva-portal.org. Uppsala University Library. Archived (PDF) from the original on 2016-04-06. Retrieved 2016-04-06. ↑ Posner, Sarah (29 November 2012). "Kosher Jesus: Messianic Jews in the Holy Land". The Atlantic. https://www.theatlantic.com/international/archive/2012/11/kosher-jesus-messianic-jews-in-the-holy-land/265670/. This page was last changed on 5 April 2019, at 10:56.